At the weekend I took the long route down to Pembrokeshire to pay a visit to Ramsey Island before it closes for the winter at the end of next month. 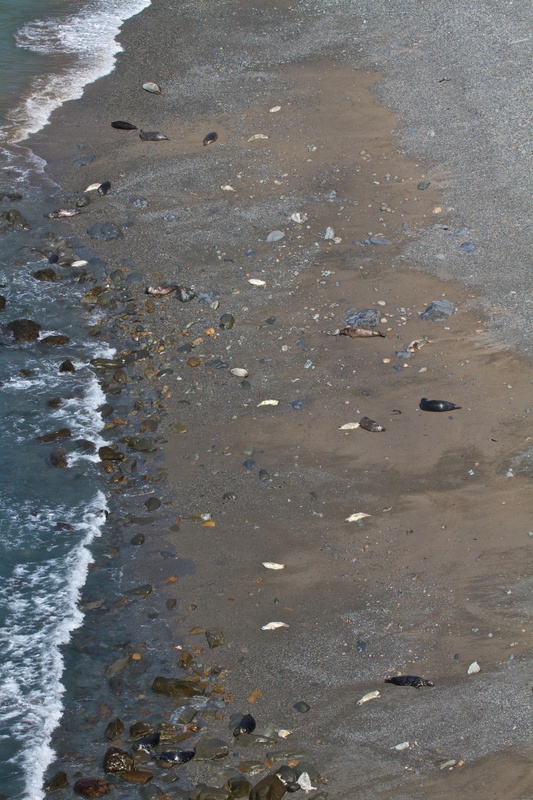 After spending another couple of weeks volunteering there in June, I wanted to visit later on in the season, especially wanting to see the grey seals pupping on the beaches. I tried to make the trip a couple of Septembers ago but poor weather on three consecutive days thwarted my attempt. This time I left my decision to visit to the last minute and with Saturday’s weather looking to be set fair, I set off down through Wales on Friday afternoon. The journey took longer than usual as I went via a different route, using country lanes through the heart of mid-Wales, eventually arriving in time to watch the rugby in the pub. Having left my plans to the last minute, I couldn’t get a room in the B&B I used last time; the Coach House in the centre of St David’s. Instead, I booked into the sister property, Bwlch Carte, a cottage with a couple of B&B rooms on the edge of town but only about 10 minutes walk from the centre. 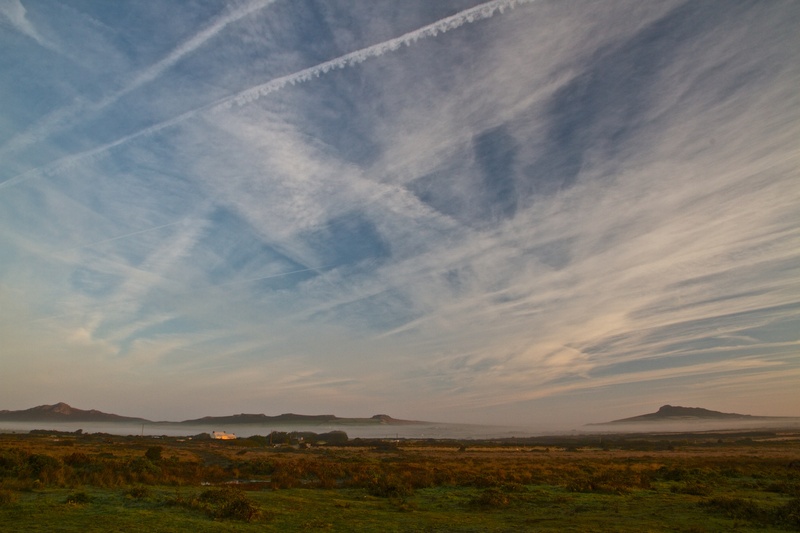 I was glad I did as I woke to the view below – having left the curtains open, I woke to see mist across the heathland behind the cottage, with the hills poking out of the top – I’m glad I didn’t lie in! The weather was perfect and the crossing to Ramsey about a calm as I’ve seen it. I spent the day wandering around the island, feeling like I should be getting on with some tasks, but instead just enjoying the scenery and sunshine. I had hoped that the heathland flowers would still be out but they had long faded and I will need to visit in late August to get them in their prime. However, just as photogenic, the drying grass and wilting bracken gave a rusty autumn tint to the land, showing that the fine weather was possibly just a last lingering flicker of the summer. Most of the way around the island, where sounds could float up from the bays, I could hear seals, but it was only when I got to Aber Mawr, the largest bay on the island, that the importance of Ramsey Island for pupping could be seen. Ramsey is the largest breeding site for Atlantic grey seals in southern Britain and around 700 are born on its beaches every autumn. Aber Mawr had its fair share with cows and calves spread out across its sand, pebbles and rocks. The bird life was a little quieter than when I was there in June; some of the summer visitors were still around but the cliff-nesting birds were all gone to sea for the winter. However, the autumn migration was well underway with waves of hirundines (swallows and martins) flying through on their passage south. Before the 4:00pm boat arrived to take the visitors back across the Sound, including me for once, I spent a little time looking for a wryneck in one of the bays but without any luck – I’ll have to wait longer for my first ever sighting. It was with sadness that I drove home yesterday – it’ll probably be summer again before I make another trip to the Island – but the long journey was well worth it, even for a visit of just a few short hours. 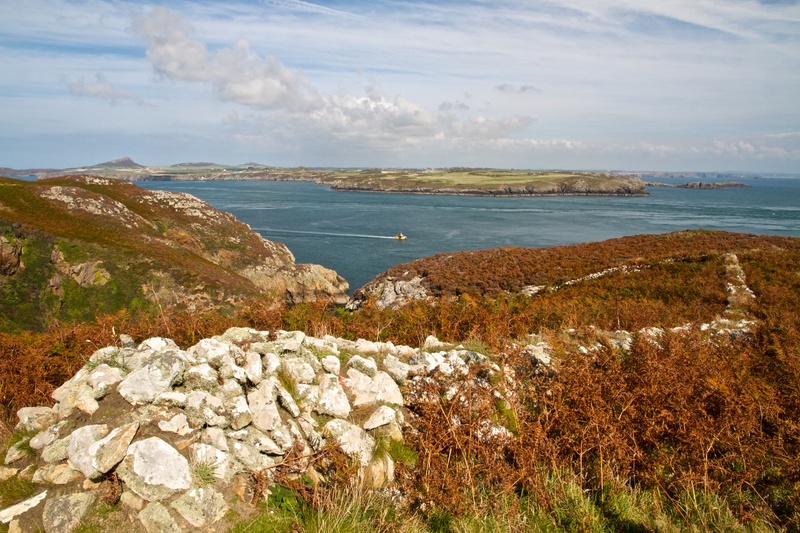 This entry was posted in Ramsey Island and tagged Coach House B&B, Pembrokeshire, St David's by daftmumblings. Bookmark the permalink.